DONETSK, Ukraine -- As a wobbly cease-fire keeps eastern Ukraine’s warring factions apart, Russia’s ruble is conquering new territory across the breakaway republics. 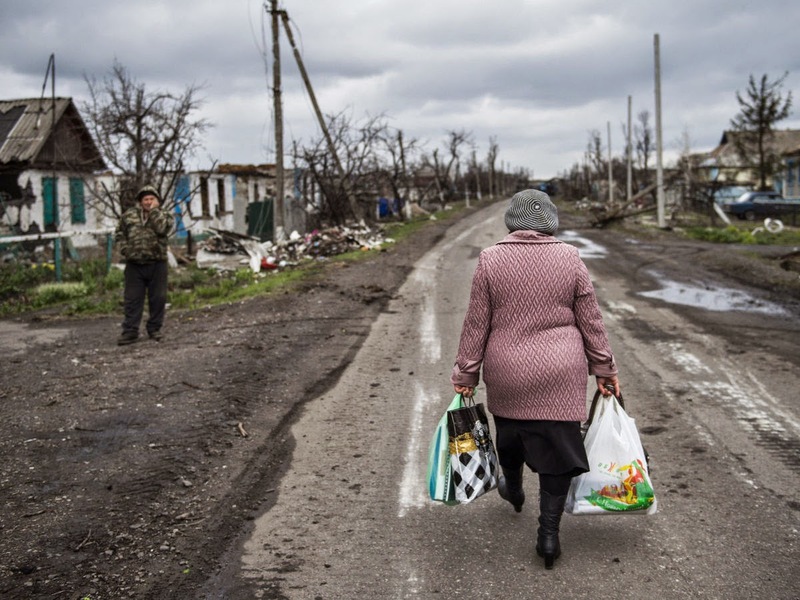 A woman walks back to the village of Nikishino in Ukraine, on April 21, 2015. In Donetsk, the conflict zone’s biggest city, supermarkets have opened ruble-only checkout counters to serve the fighters in camouflage lining up along pensioners. Bus and tram tickets come with a conversion from Ukraine’s hryvnia to the Russian currency. Gas-station workers are paid in rubles because that’s what their rebel customers use to fuel their armored jeeps. “There are no problems in shops, they all accept rubles,” said Natalya, 36, a hairdresser buying groceries for her parents, who declined to give her surname for fear of reprisals. The ruble’s creeping advance shows how the troubled regions are slipping further from the government’s grasp, even as a peace accord brokered by Germany, France and Russia calls for the nation of more than 45 million to remain whole. Separatist officials haven’t yet made their currency plans clear. The precedent in ex-Soviet countries from Georgia to Moldova shows that similar shifts can help entrench pro-Russian insurgents. “The increasing use of the ruble is yet another sign Russia’s going to keep de facto sovereignty over the territory it and the separatists control,” said Cliff Kupchan, Eurasia Group chairman in New York. Georgia’s breakaway regions of Abkhazia and South Ossetia, where Russia has backed separatists for years, use the ruble as their main currency. Moldova’s rebel Transnistria enclave created its own ruble after rising up against the national government with help from Russian forces as the Soviet Union crumbled. Russia introduced the ruble in Crimea shortly after annexing the Black Sea peninsula from Ukraine last March. Ukraine is the one place in the world where the ruble’s 46 percent plunge against the dollar in 2014 didn’t make it any less attractive, considering a 48 percent drop in the hryvnia, the world’s worst performer for the last two years. The Russian currency has staged a partial recovery in 2015, with April its best month on record. It advanced 0.4 percent on Tuesday. And the ruble has been welcomed in Donetsk, where most shops and businesses now accept it. Hryvnias are no longer available from cash machines in rebel-held territory, forcing locals to go to other parts of Ukraine to withdraw money. The dearth of Ukrainian currency, exacerbated by travel curbs imposed by the government in Kiev, is one reason a new currency regime is needed, according to Andrei Purgin, a leader of the self-proclaimed Donetsk People’s Republic. Rubles also help with the increasing demand for Russian goods, he said. “We see Russian products replacing Ukrainian ones in shops in Donetsk,” Purgin said in an interview. Alexander Kofman, the DPR’s foreign minister, disagrees. He says the ruble is replacing the hryvnia and backs setting a timetable for a full switch, like in Crimea. Russia’s central bank, which facilitated that transition, declined to answer e-mailed questions on the ruble’s rise in eastern Ukraine. In another show of faith in the Russian currency, the rebels started paying pensions in rubles to some Donetsk residents after the war cut off funds from the government. The cash comes from “external tranches,” the DPR’s press service said, declining to elaborate further on its origins. “I don’t care that it’s in rubles,” said 67-year-old Fedor, who queued for five hours to get his money and refused to give his last name. In the other rebel region, the self-proclaimed Luhansk People’s Republic, 85 percent of payments are made in rubles, with the hryvnia accounting for 12 percent and the dollar making up the rest, Russia’s state-owned TASS news service reported Monday, citing Igor Plotnitskiy, the LPR’s leader. Ukraine’s central bank says the hryvnia is the country’s only legal tender. And while rubles are widely accepted, and U.S. dollars are hoarded as the economy crumbles, the national currency still dominates in Donetsk for now. “When I bought something with rubles in a small store, three cashiers ran over to look because they’d never seen them before,” said Dina Kopsova, 31, whose husband works in Russia. Oleksandr Ilyin, who owns a photo-printing shop, estimates only one in 10 Donetsk residents uses rubles, mainly pensioners. Nevertheless, the appetite for rubles is growing, even if it’s hard for people like Natalya, the hairdresser, to adjust. “It’s taking me a while to get used to this money -- the notes are like candy-bar wrappers to me,” she said.